22'' high, 13'' wide, and 9'' thick. Stone type: light-coloured local freestone. Cross shaft fragment, dated to late eighth century. 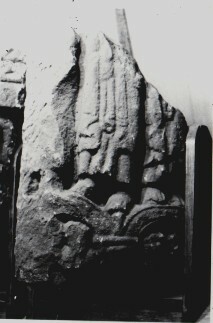 This fragment has standing figures. It is thought there were three figures on top of the two arches. Under each arch there were two figures. Collingwood, W.G., , ‘Anglian and Anglo-Danish sculpture in the West Riding, with addenda to the North and East Ridings and York, and a general review of the Early Christian monuments of Yorkshire’. In Yorkshire Archaeological Journal (1915) 22, 129-299.